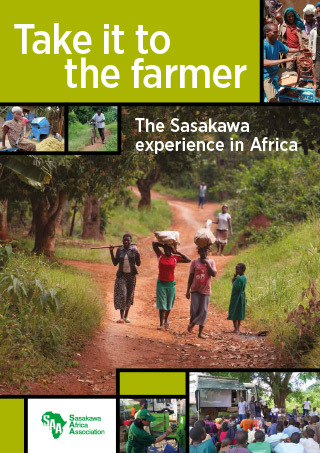 Enhancing crop productivity in food crops is generally not enough to lift smallholder farmers out of poverty. Farmers must add value to their primary produce and also diversify their range of income-generating activities, both on and off the farm. ITraining of the trainers, who are primarily the extension staff of the Ministry of Agriculture in all participating countries, is critical for SAA operations. Field demonstrations and capacity building of trainers, farmers and entrepreneurs, will help provide for a lack of professional postharvest extension staff in the focus countries. Establishing farmer learning platforms to provide training and demonstration programs for such technologies requires strategically deployed permanent sites where equipment is housed, demonstrated and maintained, and where farmers can come together to learn how to use and benefit from them. 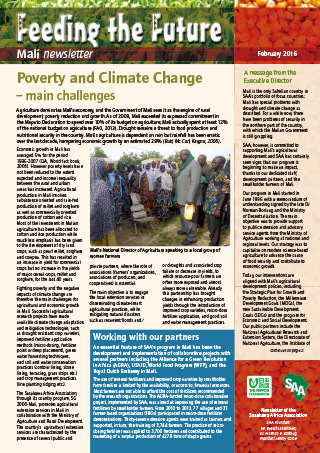 These staging areas will include well-established platforms for farmer associations/groups, such as the One Stop Center Associations (OSCAs) in Uganda, the Niet@kene farmer association centers in Mali, and Women in Agricultural Development (WIAD) associated with the Ministry of Agriculture in Nigeria. 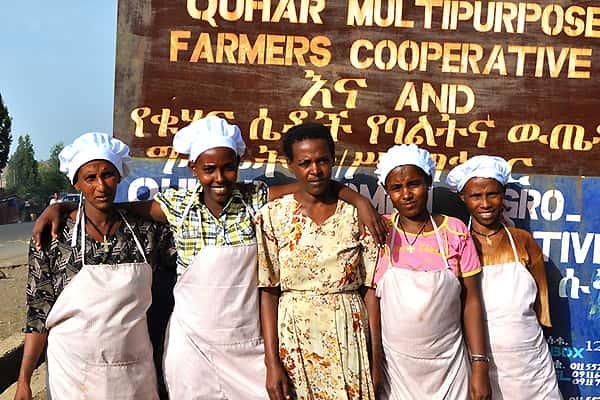 In Ethiopia, the primary cooperative (PC) centers are being involved. The establishment of the Postharvest Extension and Learning Platform (PHELP) for various enterprises, identified through the needs’ assessment surveys, started in 2010. The different platforms are now being equipped with the appropriate technology packages. The use, maintenance and management of the technologies are demonstrated – with a basic management course given to those interested in taking up the processes as a business enterprise. In the process, the PHELP is developing into a postharvest and trading center (PHTC) with the inclusion of warehousing and storage services, and farmers are linked to reliable markets. With the properly trained management team from the farmers’ group, the center should sustain its own operations. Ceremony to open airtight grain storage bags (PICs) to check quality of the grains. Much of the Theme 2 postharvest handling work is directed toward strengthening the competiveness of commercially-oriented smallholder farmers engaged in Theme 1 (crop productivity enhancement) activities. Theme 2 staff help farmers to improve the efficiency postharvest handling to improve the quality of grains, and other produce, which include among others, minimum breakage, free of impurities, and un-infested. 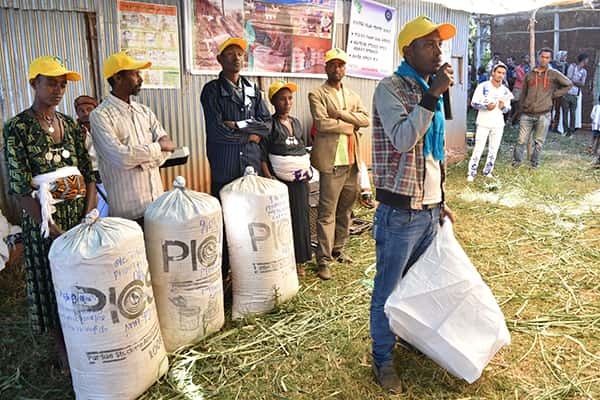 Extension training programs sensitize farmers to market requirements for quality grain. Theme 2 seeks to introduce improved technology (largely mechanized) for threshing/shelling, drying and milling. Reducing postharvest storage losses is a priority for all participating smallholder farmers, whether they are food-insecure or more commercially oriented. Theme 2 team works with resource-poor, food-insecure families to provide off-farm employment opportunities through the development of agro-processing enterprises. Women farmer groups are being assisted to produce marketable products from locally available crops that can be sold in local markets and in larger cities to supplement farm income. These processed food products are prepared using household recipes, and home economists provide technical advice to improve nutritional value and hygiene (in processing and packaging) to make the new products more appealing to consumers. The products are proving to be popular, both locally and in major towns and cities, and offer the potential for developing future agribusinesses. SAA is also interested in assisting rural dwellers, especially women, to develop agribusinesses that add value to the crops in the SAA crop menu. Examples are parboiling of rice, oil extraction from groundnuts, producing condiments from soybeans, and making flour from various cereals. Focusing on agro-enterprises built around food crops addressed under Theme 1 provides an additional benefit from improving crop productivity, as well as from improved postharvest handling and agro-processing activities, and linkages to markets. This sort of integrated activity represents the fullest expression of the value chain within SAA's new development model for smallholder farmers. 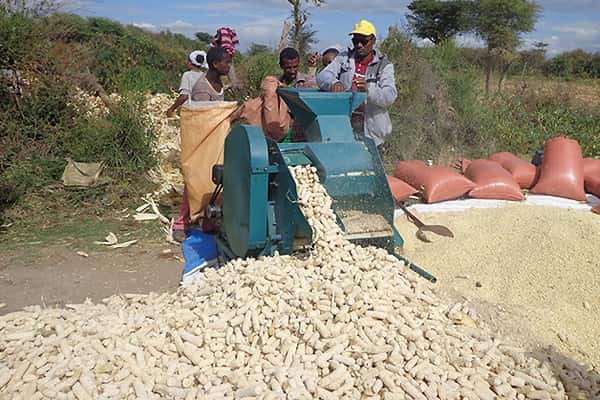 One of SAA's strategies to improve adoption of postharvest handling and agro-processing is to promote private service providers to supply value-adding mechanized services to farmers. The good example is the introduction of mechanized teff threshing in Shashemene, Ethiopia, which has been highlighted previously. Teff threshed by machine takes a fraction of the time required with traditional methods, it is cleaner and the grain is less damaged. However, a motorized threshing machine is too expensive and has too high capacity to serve only one farmer. To meet the demand, there has been a rapid scaling up of some 350 small-scale commercial threshing enterprises in Shashemene alone. This small private rural business model can be applied to maize shelling, rice threshing and milling, and flour making. 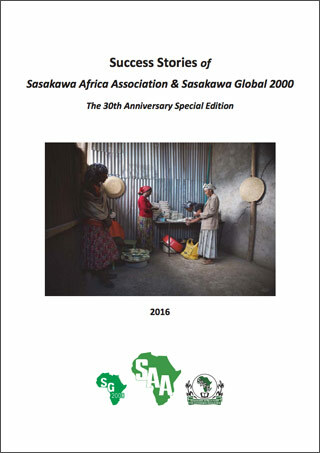 It is now being applied by SAA in other focus countries to scale-up the adoption of potentially profitable postharvest technologies through private service providers. SAA targets the youth groups in the rural areas to see the potential of agriculture as a business. A service-provider providing maize threshing service in a village. SAA is committed to bringing more labor-saving, quality-improving machinery and process technology to improve postharvest handling and agro-processing. Developing strategies to supply suitable agricultural machinery to smallholder farmers in the most affordable and sustainable way is a major objective in the T2 program. We offer a service to identify and validate agricultural equipment related to the crops addressed in our T1 crop productivity enhancement program and advise our country programs in selection and sourcing of such technology – either imported or locally-manufactured. We work with research and development institutions to develop equipment, and with machine fabricators to adapt and demonstrate selected equipment, as well as provide training to service providers and other end users. We train local manufacturers so that they can sustainably and cost-effectively produce high-quality machinery for production, postharvest handling and agro-processing. And, in collaboration with Theme 3, we provide technical support to each country program in identifying market linkages along crop value chains to facilitate the use of value-adding technologies. We work to ensure that good maintenance systems are also put into place to sustain the adoption and utilization of improved technologies. See Senior Staff section for more information.